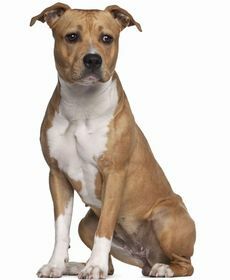 Crossed between an American Pitbull Terrier and an Olde English Bulldog, the Olde Pit Bulldogge is a lively, generally healthy pup. These crossbreed dogs get the best traits from their parent breeds. 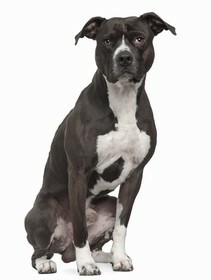 They are strong, powerful, and resilient to most conditions and diseases that would ail other dog breeds. However, the conditions they are prone to are inherited from one or both of their parent breeds. 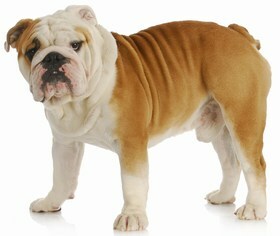 Olde Pit Bulldogges are predisposed to allergies, because of their Olde English Bulldog genetics. These allergies usually flair up around springtime, when pollen, dust, and mites are at their worst. During a flair-up, your pup will develop itchy, red spots on their chest, back, and bottom. They will bite and scratch these spots continuously to relieve the itching. However, constant itching could create a bacterial build-up, resulting in skin infections that are harder to treat. At the first sign of allergies, plan a visit to your vet for an examination and prescriptions for allergy medications. This condition is caused by a disruption in the thyroid hormones that regulate energy, mood, and weight. Olde Pit Bulldogges that suffer from this condition will gain weight quickly, despite eating a balanced, healthy, appropriate diet. They could also develop skin irritations along their backs, resulting in hair loss in ringed patches. When you notice these symptoms, ask your vet to run blood tests for hypothyroidism. If your dog receives a positive diagnosis, the vet will prescribe oral medication to level out his thyroid hormones. Other health issues that may occur in Olde Pit Bulldogges are eye problems, such as glaucoma and cataracts, bloat, and hip dysplasia. However, routine vet check-ups from a young age will keep your pup happy and healthy for the duration of their 9-14 year lifespan. In the puppy phase, Olde Pit Bulldogges are boisterous and bouncy with lots of energy to spend. They love playing games like tug-of-war or chase, and their overall disposition is positive, friendly, and energetic. Unfortunately, because of their hulking, muscular appearance, some people may be afraid of your crossbreed dog. However, when treated with respect and returned friendliness, these pups rarely act aggressively. American Pit Bull Terriers, through no fault of their own, are renowned for having aggressive tendencies. The Olde Pit Bulldogge is subject to the same misconceptions, but early socialization and persistent training will give your pup a less intimidating demeanor. The Olde English Bulldog genetics are on your side, as these dogs are considered the friendlier, happier, more rambunctious of the two parent breeds. Olde Pit Bulldogges are protective and loyal, especially if they have grown up with children in a family. Wary of strangers, these crossbreed dogs take a few hours to warm up to new visitors. To train your pup, establish dominance as pack leader immediately. 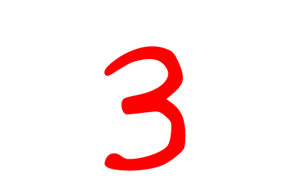 This means using concise, clear instructions to voice your commands. If your pup believes he is the Alpha dog, he may try to challenge your authority by being apathetic and ignoring your commands. Reward good behavior with meaty, healthy treats and praise, but rival bad behavior with persistence, determination, and consistency. Never, ever use physical force to train your dog. Eventually, the Olde Pit Bulldogge’s eager-to-please nature will take effect, making it easier to train him. They make great protectors and nightly watchdogs, especially when taught how to remain alert for sounds of intrusion. These crossbreed dogs will go to any lengths to protect their family if need be. 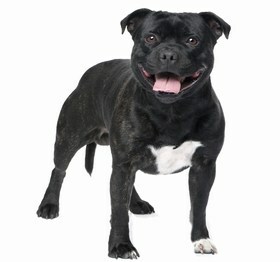 Intolerant to extreme hot or cold conditions, Old Pit Bulldogges have a short, coarse coat. In the summer, they shed regularly, so brush them at least once a day. In the winter, their coat becomes fuller to protect their skin from cold weather. To avoid skin issues, you should bathe your crossbreed dog bi-weekly with a gentle dog shampoo. If your Olde Pit Bulldogge has tested positive for allergies, use vet-recommended sensitive shampoo to avoid an outbreak of itchy, red spots. Trim his nails with care, as Olde Pit Bulldogges have exceptionally long blood vessels in their nailbeds. Your best bet is to use a nail file to smooth and round out his nails to a shorter length. Or, take him to a reputable groomer if you are uncomfortable trimming or filing your pup’s nails on your own. Olde Pit Bulldogges have flappy, floppy ears that gather dirt and debris easily. Use a cotton ball to swab the outer edges of his ear gently, preferably with vet-recommended cleaning solution. Never stick a swab into the ear canal. This could cause ear infections, or worse, a rupture of the eardrum. Olde Pit Bulldogges have healthy appetites. They prefer meaty, hearty meals, so invest in a high-quality dry dog food. You could supplement a selection of dog food gravies to make it heartier and more appetizing. Feed your pup 3.5 to 4 cups of dry kibble twice a day. The kibble you buy should be chockful of good protein. Check the label for ingredients that are mainly meats and whole grains. Avoid fillers, by-products, and preservatives, since these could have an adverse impact on the health of your Olde Pit Bulldogge. These crossbreeds are prone to weight issues, so use treats as rewards only. Looking for an Olde Pit Bulldogge? If you are buying an Olde Pit Bulldogge from a breeder, expect to pay upwards of $700 for a puppy. Adult females usually go for $500 and adult males cost between $350 and $400, if they are of breeding age. It is rare to find an Olde Pit Bulldogge in a shelter, but you can check. Adoption fees will run around $250 to $300, excluding vaccinations and a routine vet visit. Ranking takes into account a few basic factors including cost, skill level needed, high vs low maintenance and how critical regular training is to success. Olde Pit Bulldogges, whiles friendly and healthy, are a 3 on the Paws ‘N’ Pups scale. Their independence while training can be a hassle, but through hard work and dedication, these crossbreeds make great family pets.